One lazy afternoon (in which wasn't really lazy; I was really sick) I decided to give this book a go and everything inside of me exploded in delight. Everything Stephanie had ever said about the book was true. I quickly made good on my personal promise to purchase a hard copy of the book. 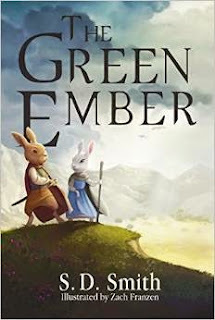 The Green Ember is the first of what shall clearly be a series of books about Heather and Picket, two young rabbits with a past that is shrouded in mystery. They live with their parents in what might an idyllic woodland. They have never faced conflict or known great fear until one fateful day when their community is attacked by wolves. Heather and Picket are off berry picking when the trouble arises. Unable to return home to their parents they find themselves being chased by these fearsome creatures. They make a desperate escape, successful only because their uncle, Wilfred, located and rescued them. Heather and Picket are eventually brought to a community of rabbits where they are told of the story of King Jupiter, noble leader of the thirty warrens. King Jupiter was a mighty warrior and also much adored. Sadly King Jupiter was betrayed and killed. His heir disappeared, along with the Green Ember which would identify him, and his loyal subjects sent into hiding. 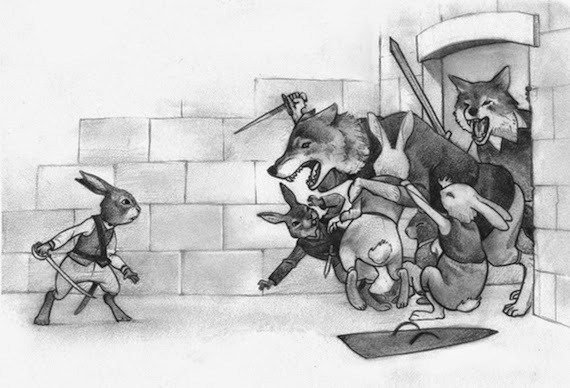 Heather and Picket are placed with group of rabbits who have formed a community with a goal of restoring the heir of King Jupiter to a position of leadership. There is much talk of a better tomorrow where wrongs will be righted and freedom will be restored. This hoped for place is referred to by rabbits as the Mended Wood. 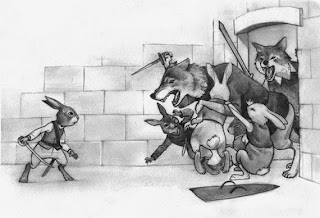 Yet before the Mended Wood, the rabbits must struggle on, developing productive skills and preparing to fight to restore the life they knew under King Jupiter. As beautiful as the idea of the Mended Wood sounds to Heather and Picket, they are made aware of the entire tale of King Jupiter and how his story is wrapped up in their own family history. Perhaps their life in that idyllic woodland was not as perfect as they originally believed it to be. They must struggle to find their place in this community which they have been placed. The Green Ember is a fantastic adventure story. It is also a mystery which slowly unfolds to the reader in a rather tantalizing way. I am hardly doing the book justice with this review. There are a myriad of details I have left out for you to discover as you read the book yourself. (And really? You must do so.) As I read along I kept telling myself I needed to read slow. However, each chapter tends to end on a cliff hanger, resulting in a desperate need to read on. I buzzed through it as a result. It's rather gripping. Immediately after I finished the book I looked up author S.D. Smith's website to learn more about him and the book. I left a comment telling him how much I loved his story and he kindly dropped me a note offering a couple of giveaway copies of the audiobook version if I'd like. I certainly wasn't going to say no to that! I feel absolutely confident that you guys are going to love this story! This debut book by S.D. Smith has been welcomed with open arms by people in our household and we are just delighted to share the story with you as well. Would you like to win a copy of the audiobook version of The Green Ember ? Simply leave a comment below INCLUDING A VALID E-MAIL ADDRESS to be entered into the drawing! I have two copies to giveaway. This contest will be open to U.S. and Canadian residents and will run through Friday, April 17th. THIS CONTEST IS NOW CLOSED. THE WINNERS (as selected by Random.org) ARE AS FOLLOWS: #8 - Beth Starr AND #17 - Bluerose's Heart. "My place beside you, my blood for yours. Till the Green Ember rises or the end of the world!" 1. HOW DID I MISS THE FREE KINDLE DEAL?!? This is definitely on my reading list. Neither of my county libraries has this, so I definitely want to win...and audio is awesome! I want to read this book just because of the cover. Sounds like a good one! Is it rude to leave a comment that only says I told you so? This is a favorite read aloud for our family. Loved it! We are going to have to read this and having it on audio means it would get read (or listened to). Sounds like a fun read! And I love the cover. I am definitely interested in reading it aloud to my eldest. I'd love a copy! I follow a blog called The Story Warren where this author is a regular contributor, so I knew about this book but hadn't checked it out. I don't know how I missed the free Kindle deal. I'd love to win a copy! Oh, yes please!! How have I missed this one? My kids listen to audio books ALL.the.time. We'd love to win a copy! Our family would love this. I grabbed this one for my kindle, too. You've made me move it up to the top, so hopefully I'll read it soon. :) Outside of picture books, I rely more and more on audios and videos of other people reading for my boys these days, so I think Grasshopper would especially love hearing it.